First up is the Lip Color in Velvet Orchid (59). It's incredibly soft, smooth, creamy and pigmented. The color comes off a little cooler on the skin than in the tube. It is one of the most perfectly mauve-y colors I've come across with a very strong lilac undertone. There is just the slightest hint of shimmer which gives more of a pearlescent sheen than anything glittery. It smells like the other lipsticks with a hint of cocoa that wears off quickly. The Black Orchid (18) Lip Color is still creamy, but not as creamy as the Velvet Orchid. And because it's such a dark purple color, it took a few more swipes to get it looking even. In the tube, I thought it would be a darker warmer purple with a lot of red, but it is a true orchid-like purple, closer to fuchsia and magenta. There are no shimmery bits in the Black Orchid so it's a true cream color. Both come in the special edition packaging with the gold trim and the ribbed panels and retail for $60 USD. They should be arriving mid to later this month to TF counters. As for the Nightbloom Powder, I could only get my hands on the Black Bloom (01) colorway. I wore it out last night and I felt like it reminded me of another highlighter. 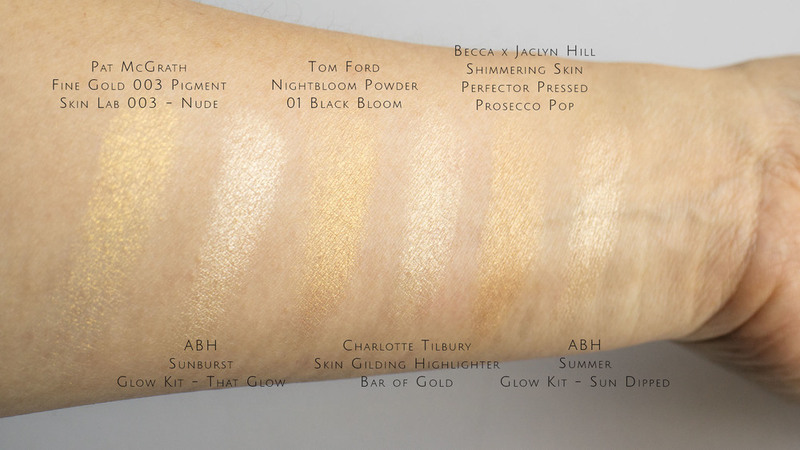 I couldn't put my finger on it, so I decided to swatch some of my gold-toned highlighters today in the daylight to compare. It is EXTREMELY close to Prosecco Pop - I would say the Prosecco Pop would qualify as a dupe. And I can't honestly say that either formula feels better. If anything the Tom Ford is a little more subtle... a little... teensy teensy bit. But they're very close. The Pat McGrath is similar, but gives off a different effect - not quite as smooth and is more reflective and dramatic. The others weren't very close - much whiter and brighter. It has no scent, which I was happy about. I was afraid everything in this collection would smell like one of the Orchid Perfumes. The packaging is the same size as the TF blushes and small bronzers. (Of course, I was hoping it would be the size of the larger palette.) I'd still like to try out the Velvet Bloom colorway, but at $80 USD a pop, I will definitely try it out before purchasing. The packaging alone almost makes it worth the hefty price tag. I'm such a sucker for this ribbed black with gold accents. Fabuloso! Personally, I'm glad I snatched up these beauties. These are perfect for you collectors out there.